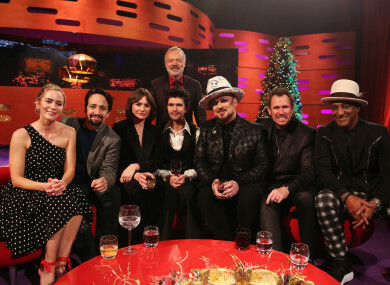 If you’re staying up late tonight, Graham Norton’s last episode before Christmas will feature Emily Blunt discussing her role as the new Mary Poppins, as well as Lin-Manuel Miranda, Ben Whishaw and Emily Mortimer, who’ll also be discussing the new version of the musical. Graham also invited Boy George and Culture Club onto the show for a musical performance. The biggest name on tonight’s Late Late Show lineup is Colin Farrell, who’ll be talking about his work with skin condition charity DEBRA, which helps patients suffering with the debilitating condition called Epidermolysis Bullosa. Colin will be joined by EB sufferer Emma Fogarty to discuss their friendship and how it has blossomed thanks to his work with the charity. There’ll also be a segment featuring Derek O’Connor who lost his wife Maeve to bowel cancer in 2016, and he’ll be talking about dealing with grief in the festive period and how he’s helping his three children navigate the world after their mother’s passing. After that, Ryan will be joined by former RTÉ News anchor Bryan Dobson and comedian Brendan Grace who’ll be talking about their lengthy careers. Another Christmas, another Mock the Week festive special. Dara O’Briain and Hugh Dennis serve up their unique festive take in a Christmas special filled with seasonal material, out-takes, best bits and hitherto unseen moments. Everybody’s talking about… Derry Girls on Netflix! Our favourite group of gals and that wee English fella are finally on Netflix now. No more sitting through ads on the Channel 4 website. The perfect Christmas binge, tbh. Christmas Then and Now (RTÉ One, 8.30pm) Sinead Kennedy dusts off some clips from the RTÉ Christmas archive and fast forwards to where the stars are now. Celebrity Mastermind (BBC One, 8.30pm) John Humphreys returns for a brand new series of the quiz game, which will feature Courtney Act as a contestant. Not Going Out Live: Ding Dong Merrily on Live (BBC One, 9pm) Lee and Lucy are strong-armed into organising a Chirstmas variety show to raise money for their children’s school, but things go pretty horribly. The Great Polar Bear Feast (RTÉ 2, 7.30pm) Scientist Todd Atwood follows the Great Polar Bear Feast in northern Alaska where each year up to 80 polar bears gather on the frozen shores of Barter Island to feast on bowhead whale remains. Gordon, Gino and Fred’s Great Christmas Roast (Virgin Media Two, 8.30pm) Gordon Ramsey, Gino D’Acampo and Fred from First Dates star in this festive cooking contest. There’s Something About Mary (RTÉ 2, 11.15pm) Slapstick comedy about a man tormented by memories of a missed date with a beautiful girl to the point where he decides to hire a detective to track her down several years later. The Big Soap Quiz: Coronation Street v Emmerdale (Virgin Media One, 9pm) Stephen Mulhern hosts a titanic clash between ITV’s biggest soaps. The Last Leg Christmas Special (Channel 4, 9pm) The satirical comedy show features Sharon Horgan and Rob Delaney in their holiday special.